Colliding Particles - Episode 1: Codename Eurostar from Mike Paterson on Vimeo. Forget the cheesy narrator and hokey graphics. Wobble the camera like you're Michel Gondry filming Eternal Sunshine. Ditch the pseudo-techno soundtrack that makes the kids shake their heads at you for trying to be hip, and go for something understated. Then you might have something as good as Colliding Particles. 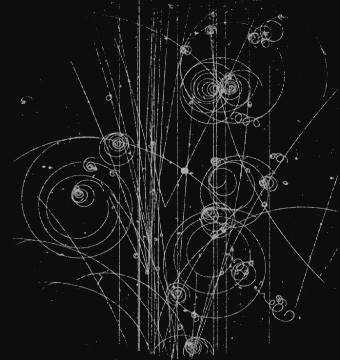 The trio are working on a strategy for pinpointing the long-sought-after Higgs boson in the particle spaghetti that erupts when two protons smash into each other at high energies. The details of their approach probably wouldn't interest you if you're not a member of the ATLAS collaboration, (or their rivals, CMS), and the filmmakers don't make the mistake of throwing you head first into deep intellectual waters. Instead of trying to teach you the Standard Model in ten minutes, they let you be a fly on the wall in the very peculiar world inhabited by particle physicists. In episode two, "Big Bang Day," we see the excitement of September 10th, 2008, when the first beam was circulated through the LHC. Instead of fighting for a shot of the action, the camera stays outside the circle of camera crews and news anchors, filming them (you can see them become hilariously self-conscious about their scripted explanations) as part of this world. Episode 3 loosely follows Jon around ICHEP, the huge annual particle physics conference held in Philadelphia. Having sat through my fair share of (surely interesting) physics talks that I didn't understand, I would have thought that devoting an entire episode to a physics conference just wouldn't work. Instead, the episode is all about how scientists exchange ideas—lots of jabbing enthusiastically at posters, waving your hands about, and talking excitedly in corners over things you're scribbling on a napkin. Episode 4, "Problems," shows you the frustrations of working on something very, very hard, and actually makes a chalkboard look utterly terrifying. So if science documentaries make you yawn, brew yourself a cup of tea (the physicists are British) and indulge in a Colliding Particles marathon. The few explanatory graphics are gorgeously and cleverly integrated into the each shot, the music's great, and they actually tell you why the LHC was shut down. Really.